Fine finish made of black anodized aluminium the KIWIFOTOS LMA-FD_EOS lens mount adapter allows Canon FD mount lens and macro accessories to be used on any Canon EOS film or digital SLR camera bodies. The mount adapter is built with multi coated optical glass. The lens distance scale can be used as well as the focusing to infinity. 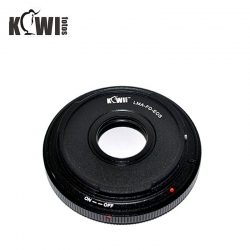 The lens fits physically, automatic diaphragm but auto focusing, or any other functions will not operate correctly. Use the lens in the fully manual exposure mode (M) and set the designed aperture with the aperture control ring by hand however you can set your camera to Aperture Priority (AV) mode to use the camera in auto exposure.